Last week I was able to attend the 10th International Conference on Concentrator Photovoltaic Systems (CPV-10) to hear an update on the area of PV where I spend most of my daylight hours. While progress in CPV is encouraging, with 2014 on track to be the largest install year for CPV technology, one of the most interesting talks was give by Senior IBM researcher Dr. Bruno Michel titled "Ecological and Economical Advantages of Efficient Solar Systems". Sounds amazing, right? Lets take a minute to explain the message of this talk in simple English. While today there are many reasons for "going solar", the business really got moving when solar was seen as a way to fight against traditional fossil fuels which release carbon into the atmosphere which increases the amount of solar energy held under the atmosphere as heat which accelerates erosion of nature's natural dampening features (such as polar ice) which therefore further accelerates warming and climate change. The idea is simple, if we generate all of our electricity from renewables, including photovoltaics, then carbon stays in the ground and the world is a big happy place. Well, Dr. Michel's talk takes this idea and simply says, "not so fast." In his work, he looks at how sunlight should be treated given the goal of reducing global warming and not just production of electricity from sunlight. This new approach revolves around the idea of what happens to sunlight once it enters our atmosphere and the phenomenon known as albedo. 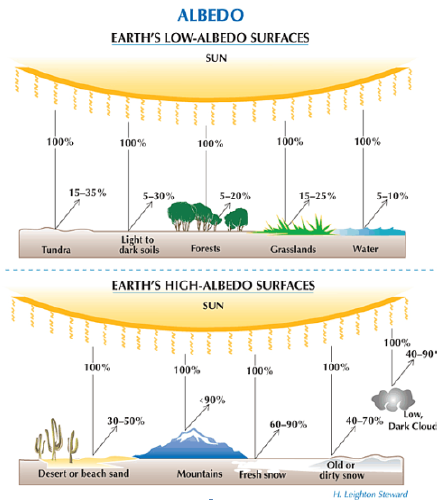 Shown below, albedo is the measure of percentage of sunlight that is reflected back into space by a given surface. The lower a surface's albedo, the higher percentage of sunlight that is absorbed by the surface and converted, generally, into heat. The higher the albedo, the higher percentage of sunlight that is reflected back into space before it contributes to heating of the planet. This draws us to a simple conclusion: if you want to cool the planet, then the sunlight getting through our atmosphere has to be converted into something other than heat or thrown back to space. This begs us to then look at the performance of solar panels today with albedo in mind, which is shown below. Taking a look, the albedo of all solar technologies is pretty low, at around 5%, meaning only about 5% of the sunlight incident on today's solar panels is sent back into space. But, what is more shocking is the portion of sunlight which turns directly into heat. c-Si is 81%, m-Si is 82%, and thin film is 87%! This begs Dr. Michel to ask the question, if you are really interested in doing your part to prevent climate change, should you (a) put solar panels on your roof and stop your usage of fossil fuel or (b) paint your roof white and forget the solar. The answer should surprise you, because if your using today's most popular solar panels (c-Si, thin film) its (b). As someone working towards wide use of solar for generation of our energy needs, this was surprising to me, but it makes total sense and is explained well in Dr. Michel's presentation, which is linked here. But alas dear solar brethren, not all hope is lost! The real point of Dr. Michel's presentation is simply that efficiency matters. As seen above, if you can use technologies which capture the maximum sunlight to electricity conversion, then the amount of sunlight driven to heat is reduced. 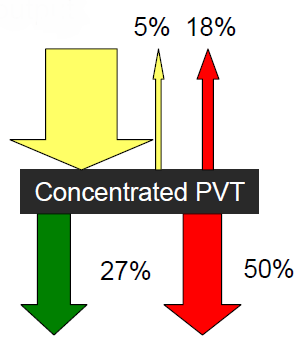 If you combine the high electrical efficiency of a CPV system with thermal capture, i.e. hot water generation, then you really have a high efficiency system, driving only 18% of incident sunlight into heating, while extracting nearly 80% useful energy, as seen below. To me, this simply is a reinforcement of a couple key things. First: know thy enemy. If your personal goal is combat climate change, then do your research and act accordingly. However, if you goal is to force your utility out of business, the get all the solar you want, of any kind. If your goal is to do both... then get efficient solar, such as CPV! Second, efficiency matters. While it doesn't always seem like it, efficiency is very important. We live in a world with finite resources, and efficiency simply means doing more with less. My personal feeling is there will always be a place for efficiency in any industry, and I don't think renewable energy is any different. The presentation from Dr. Michel simply reinforces this notion with a new perspective, science... and numbers... and ... stuff.